I’ve had ample reason to praise Hong Kong’s economic policy. Most recently, it was ranked (once again) as the world’s freest economy. And I’ve shown that this makes a difference by comparing Hong Kong’s economic performance to the comparatively lackluster (or weak) performance of economies in the United States, Argentina, and France. But perhaps the most encouraging thing about Hong Kong is that the nation’s top officials genuinely seem to understand the importance of small government. Here are some excerpts from a recent speech delivered by Hong Kong’s Financial Secretary. He brags about small government and low tax rates! 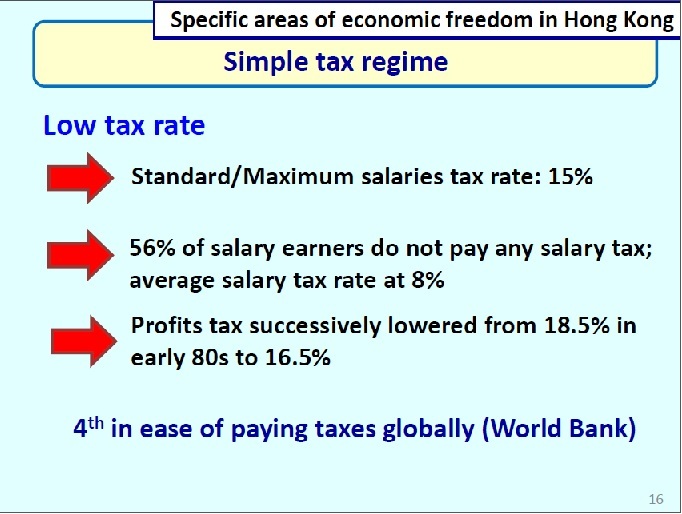 Hong Kong has a simple tax system built on low tax rates. Our maximum salaries tax rate is 15 per cent and the profits tax rate a flat 16.5 per cent. Few companies and individuals would find it worth the risk to evade taxes at this low level. And that helps keep our compliance and enforcement costs low. Keeping our government small is at the heart of our fiscal principles. Leaving most of the community’s income and wealth in the hands of individuals and businesses gives the private sector greater flexibility and efficiency in making investment decisions and optimises the returns for the community. This helps to foster a business environment conducive to growth and competitiveness. It also encourages productivity and labour participation. Our annual recurrent government expenditure has remained steady over the past five years, at 13 per cent of GDP. …we have not responded irresponsibly to…populist calls by introducing social policies that increase government spending disproportionally. 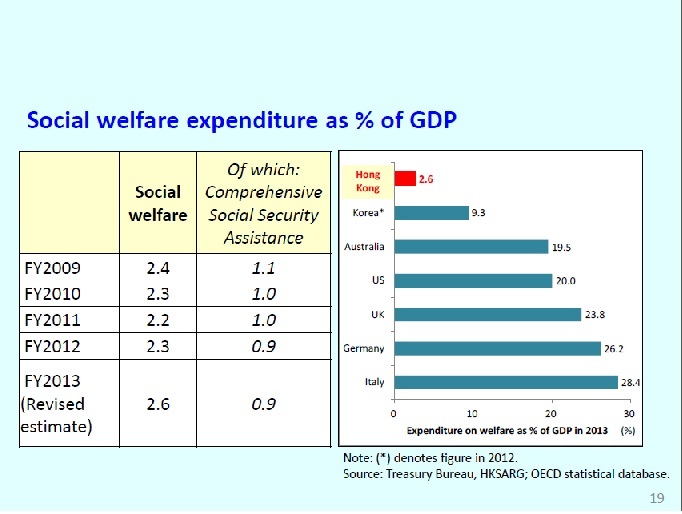 …The fact that our total government expenditure on social welfare has remained at less than 3 per cent of our GDP over the past five years speaks volumes about the precision, as well as the effectiveness, of these measures. And he specifically mentions the importance of controlling the growth of government, which is the core message of Mitchell’s Golden Rule. Our commitment to small government demands strong fiscal discipline….It is my responsibility to keep expenditure growth commensurate with growth in our GDP. Is that just empty rhetoric? The folks in Hong Kong don’t want to wind up like Europe. Last year, I set up a Working Group on Long-term Fiscal Planning to conduct a fiscal sustainability health check. We did it because we are keenly aware of Hong Kong’s low fertility rate and ageing population, not unlike many advanced economies. And that can pose challenges to public finance in the longer term. A series of expenditure-control measures, including a 2 per cent efficiency enhancement over the next three financial years, has been rolled out. And, speaking of Europe, he says the statist governments from that continent should clean up their own messes before criticizing Hong Kong for being responsible. I would hope that some of those governments in Europe, those that have accused Hong Kong of being a tax haven, would look at the way they conduct their own fiscal policies. I believe they could learn a lesson from us about the virtues of small government. Just in case you think this speech is somehow an anomaly, let’s now look at some slides from a separate presentation by different Hong Kong officials. Here’s one that warmed my heart. The Hong Kong official is bragging about the low-tax regime, which features a flat tax of 15 percent! 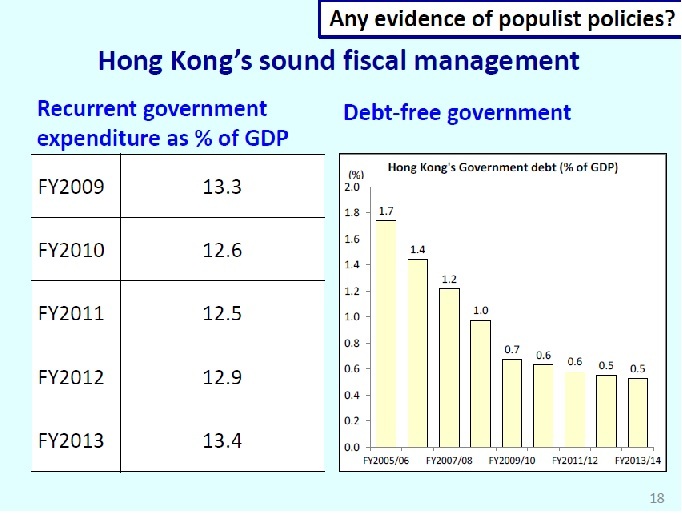 But what’s even more impressive is that Hong Kong has a very small burden of government spending. And government officials brag about small government. By the way, you’ll also notice that there’s virtually no red ink in Hong Kong, largely because the government focuses on controlling the disease of excessive spending. 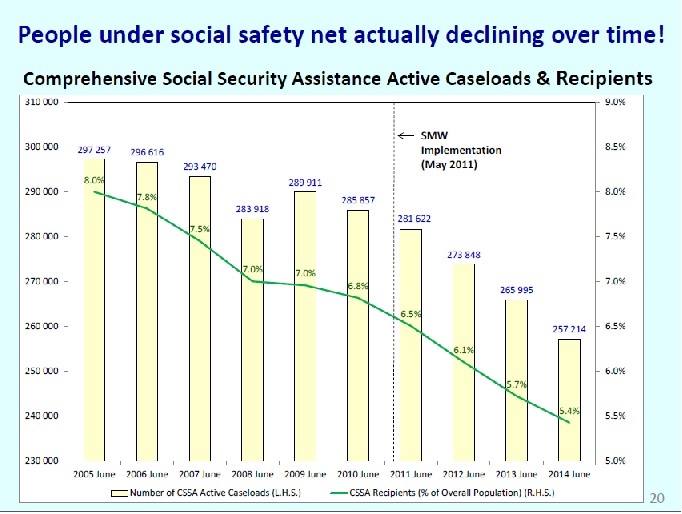 In large part, as you see from the next slide, because there is almost no redistribution spending. Indeed, officials actually brag that fewer and fewer people are riding in the wagon of dependency. Can you imagine American lawmakers with this kind of good sense? None of this means that Hong Kong doesn’t have any challenges. There are protests about a lack of democracy. There’s an aging population. And there’s the uncertainty of China. But at least for now, Hong Kong is a tribute to the success of free markets and small government. Small countries have little inertia. The effects of good/bad policy, especially those policies affecting growth, make their impact known immediately. Hence small jurisdictions have higher pressures to be realistic. These jurisdictions cannot sell the cool aid that trimming the rewards of the exceptional to insulate the less competent from the consequences of mediocrity is the way to growth — and thus systemic compounding prosperity. This is why most prosperous countries are small, with America the first notable exception (more on that later). Many foreign travelers to HK in the ’80s lamented how very few HK citizens had money while the rest of the population was only given a thin glimmer of hope to hope on and console them in their poverty. Well, guess what? Abstaining from redistribution lead to great growth. And the glimmer of hope has now shone on virtually everyone in HK. But HK’s threat comes from the north. While Chinese leaders have made great comparative strides towards a freer economy (and are now reaping the huge growth benefits), China remains a country with sub-par freedom. Fast growing and free HK must not be sitting well with Chinese leaders. Under the superficial condemnation, OECD and the other high tax nation cartels will probably celebrate, were China to squash HK. This is a big problem Singapore does not have, or at least is more remote. But even if China destroys HK, economic freedom will not die. The evolutional, Darwinian, pressure of laissez faire policies that foster motivation and high growth is too great to squelch. Others will pick up the baton. However, the mere law of probabilities makes it unlikely that it will be America. America had been a notable exception to the small-prosperous correlation. But America’s serendipitous fortune went unappreciated, and its citizens, like many electorates past and gone, finally drank the cool aid of prosperity through flatter effort-reward curves. There is no escape from these choices. The vicious cycle will intensify with small lulls of short lived hope. See Europe. Europe is America’s destiny, but America has come too far on this road to turn around — even if the sound of the waterfall starts now been heard. @nedlandp – I agree with you almost entirely. I obviously don’t appreciate corrupt politicians, but the protests in HK risk provoking China into taking action that would see the political and economic settlement dramatically altered for the worse. This should also serve as a warning to those in HK who are able to exert influence in the SAR’s administration. If the HK CEO is acting in a way that could eventually lead to intervention from Beijing, it would be in their own interests to have him quietly deposed, buying him off if necessary, and to watch for similar corruption in future office holders. My daughter is studying in Hong Kong this semester. She raves about the positive attitude of the people and visitors and the dynamism of the economy. I think she would be even more positive, if it weren’t for the student protests. My own view is that current government is so small, the damage that can be done by any single politician is also small, unless he tries to reverse course and go for bigger government.